Tommy Grieco needs new wheels! On May 10, 2003 Tommy Grieco was in a motorcycle accident that left him paralyzed from the chest down. He spent 4 weeks in the hospital, and 5 weeks in rehabilitation to learn how to adjust to his new life situation. He went from having a relatively normal American life, to having it turned upside down. His future was scary and unclear. 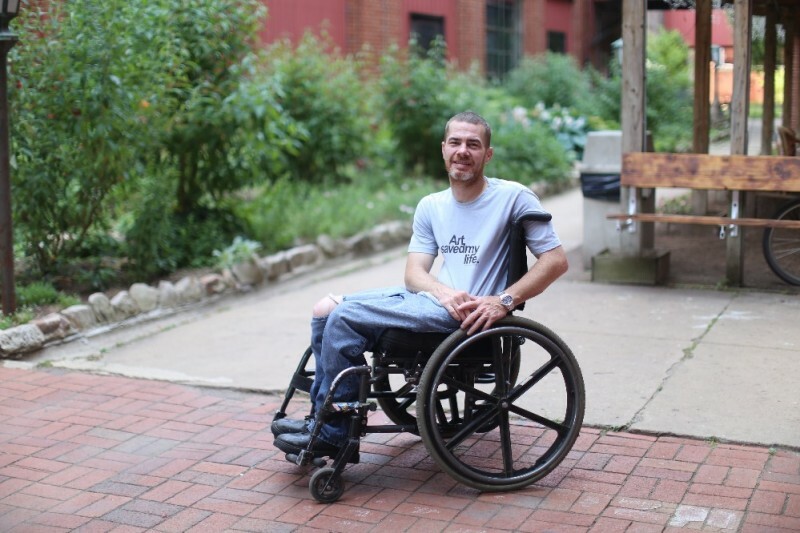 Since then, Tommy has regained his positive outlook for the future, but there are still some areas of his life that could be improved, especially in the area of mobility. With his disability, he has to think about transportation differently than the average person. He would love to enjoy the many things that others take for granted. He would love to be able to enjoy the outdoors more fully, whether it be snow covered pavement, or the hills of his family's riverlot. Currently he is a tenant at the Pajama Factory in Williamsport, Pennsylvania. In the summer months he would love to be able to join other tenants on the hiking trails and nature walks. He wants to be able to participate fully with friends and family, instead of feeling like a burden. He hopes to be able to buy an all-terrain chair that would allow him the mobility to move around in the woods, the snow, and even the beach. Tommy has not been on a beach since his accident in 2003. The chair he is hoping to buy is located in Spain, with the cost of the chair and shipping, he is looking at it costing about $3200, which compared to US prices, it is a bargain. With the volatility of the global market currently, he has set his goal to $3500 to account for possible changes between the dollar and the euro. Tommy's current wheelchair is 13 years old, the same chair he got after his accident. It is rapidly deteriorating. The tires are bare with no tread. The brakes don't work and cannot be repaired. His chair back pad is missing and he is susceptable to pressure sores. The front wheel bearings are rusted, as well as much of the hardware throughout the chair, making his chair unadjustable. Much of the body of the chair itself is not protected against the elements and will soon fail too. His insurance company refuses to help him buy a new chair and many of the items in his life that would improve his mobility. To him these items would save his life, to them they consider these items luxuries. Any money over our goal will go towards the many other items he could use to improve his life, such as a new shower bench, an updated ramp for his home, or a reliable vehicle to get him from point A to point B.
Tommy is a humble and proud man and does not like asking for assistance, but he realizes that there's nothing wrong with asking for help. He will be eternally grateful for any donation that you could make towards his goal - whether it be a monetary contribution or spreading awareness of this GoFundMe page. Thank you all that donated to this site. Your generosity shows no bounds and I am forever grateful. In a few weeks or a little more from Spain I will receive my new manual wheelchair "the beast". The rest of the donations will fix/replace my ramp at home. I'm still in shock from all the support of my friends and those who are total strangers. This is why and what a "go fund me" site is used and needed for not for frivolous items or trips to benefit no one in need. Plus, a special thanks to my friend, Shana for helping and getting things set up so quickly. Thank you so much to everyone. You made a grown man believe that there is still good in humanity. I will have pictures up on my Facebook with my new chair"the beast" whenever she arrives. God bless you all. I will never be able to say it enough, but Thank You. Thank you all for the donations so far! I did not expect this overwhelming outpouring of love and support! Thank you all so so much! Tommy, Congratulations!!! I can't wait to see the pic of "The Beast". Enjoy it in Great Health!! I will give a free 8" X 10" color photo of the P J Factory on metallic paper for any one wishing to have one from my name forward to the end. Facebook message your request to me. Pick up at the PJ Factory coffee shop. Need a week from each image requested to pick up ready. Tommy I never heard you utter a poor me word in spite of the difficult situation life has presented to you. I am so glad one of your friends ask me to help this cause. We were glad to help Tommy. Glad you made your goal. Stay strong. I know you will. You are such and inspiration to so many people!!! Tommy, you are such a sweetheart and deserve this. I'm glad you made your goal. I hope your doing well and all. Take care! You deserve the best! I hope this helps with everything you need! I could not be morepleased than to join your friends helping with your needs.